On a good day this last week, Tom went out and picked over 70 pounds of cherries! 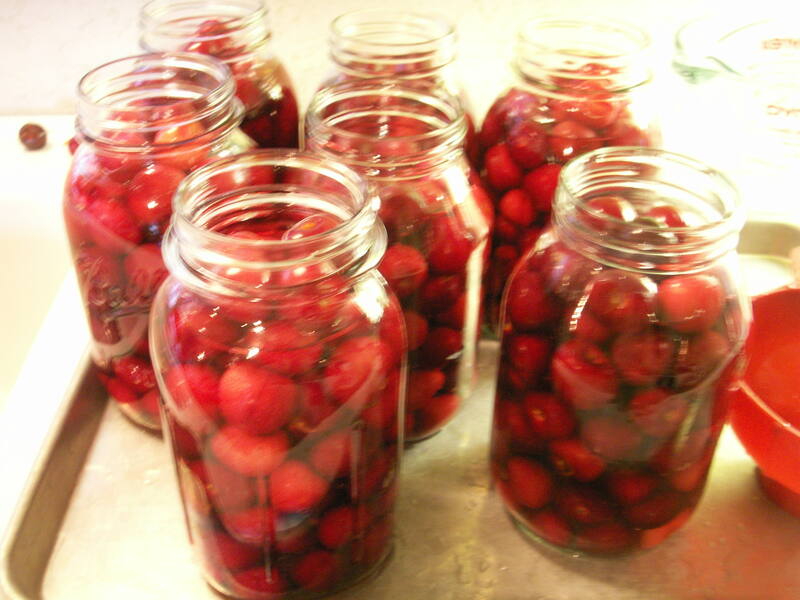 We didn’t want that many to go to waste, and since cherries are so easy to can, I thought, “Why not?” I went over to my mom’s and got the canner and a few other supplies & got to work. 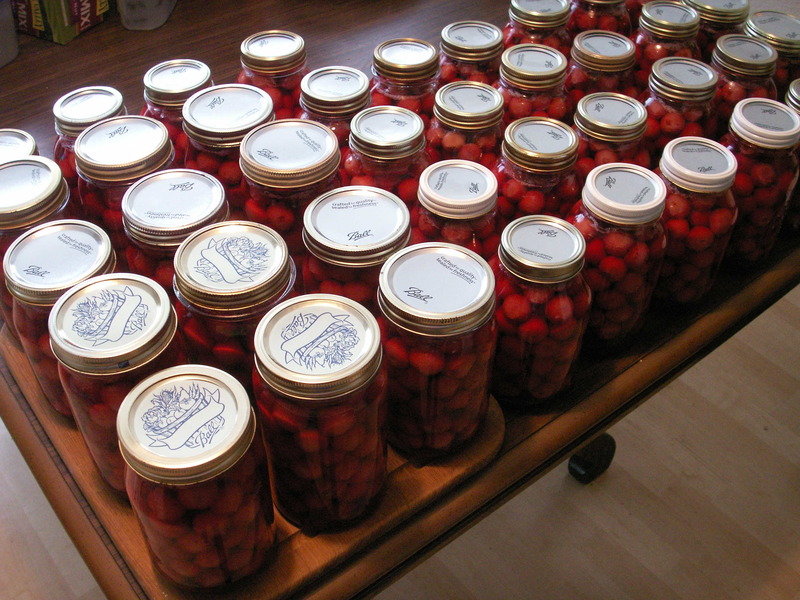 I ended up getting 40 quarts of cherries canned, and when I posted a photo on Facebook, I had a bunch of people ask for my recipe. Well, I thought I’d do one better and create a how-to blog. When it comes to “doing” stuff, the computer is my best friend right now. 🙂 So enjoy the following instructions and hopefully get some cherries canned for yourself! Step 2: Before you wash your canning jars, check for cracks and/or chips. Those types of jars cannot be used as they will not be able to seal correctly. I run mine through the dishwasher so that I know they’ve also been sterilized. Canning jars – enough for all your fruit. 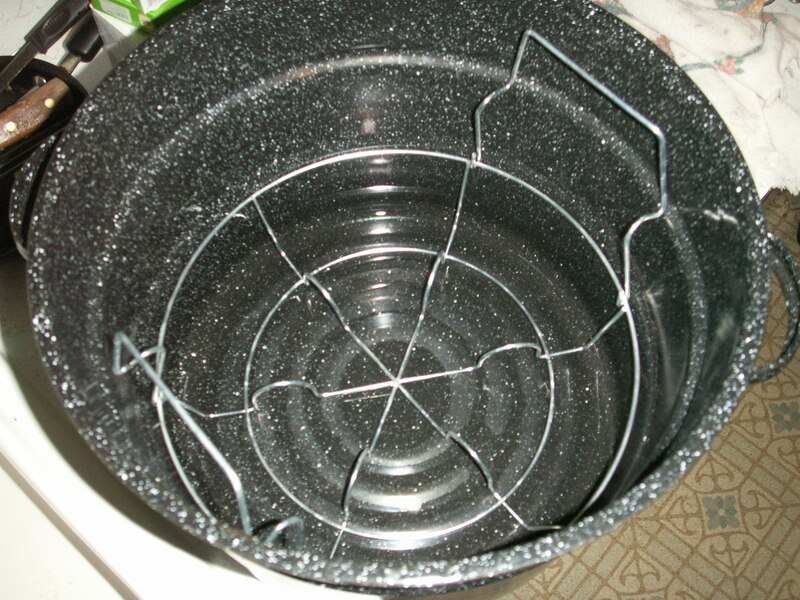 Large hot water bath canner with lid. With or without the metal rack in the bottom. 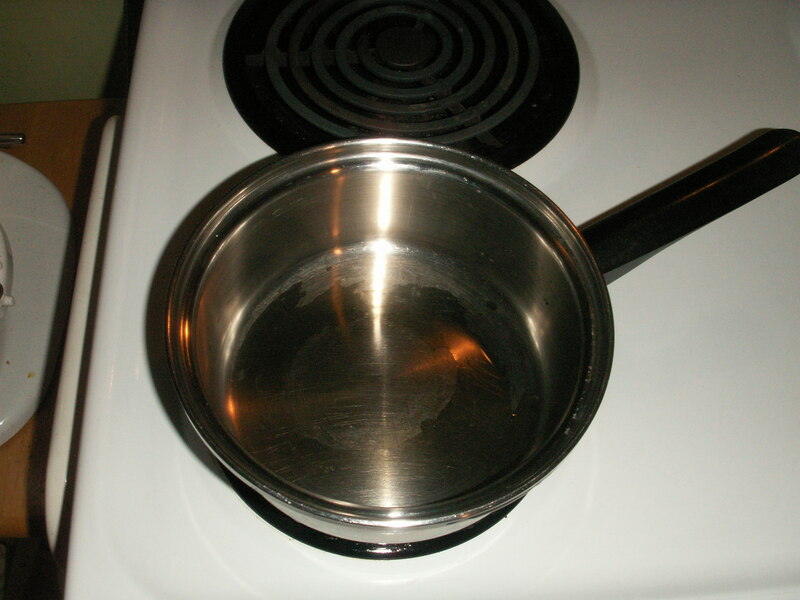 Small 1 quart saucepan for simmering canning lids. Larger 4 quart saucepan for cooking the sugar syrup. 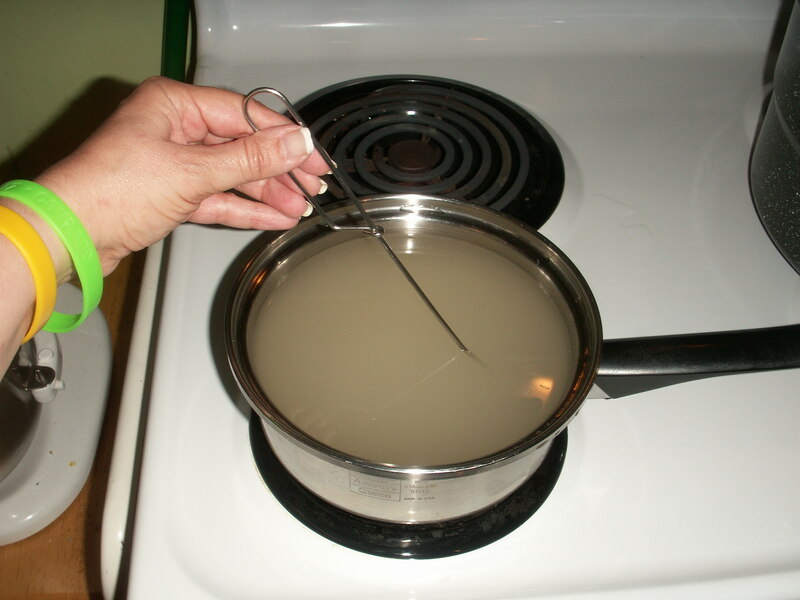 Canning tongs to remove jars from boiling water. Quart sized canning jars – narrow or large mouth doesn’t matter. 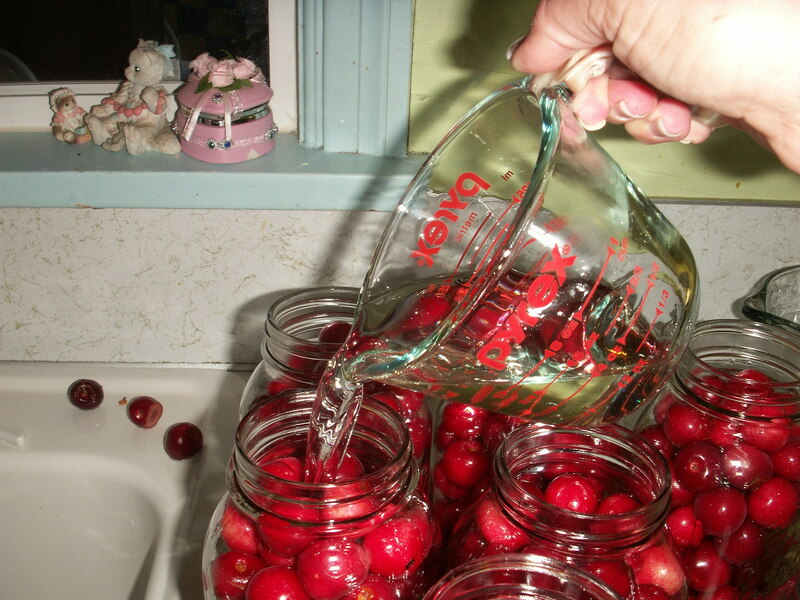 Take your total pounds of fruit, divide it by 1.5 and that will be approximately how many jars that you will need. 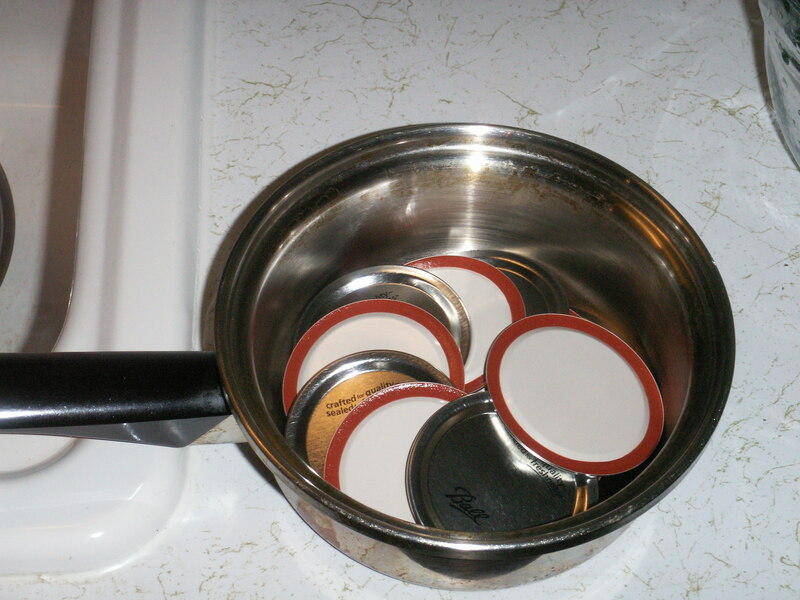 Self sealing canning lids – as many as you have jars. 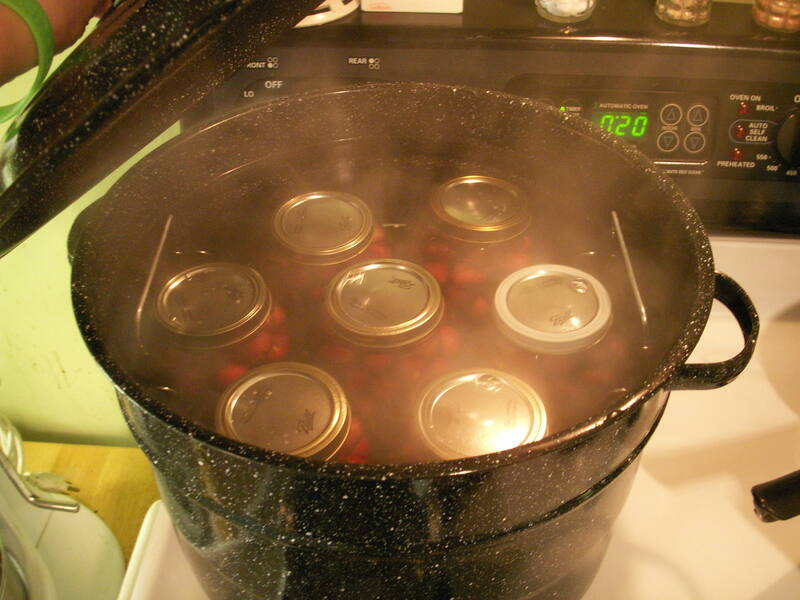 I like the Ball brand best – when I did my canning, I had 100% sealing results. 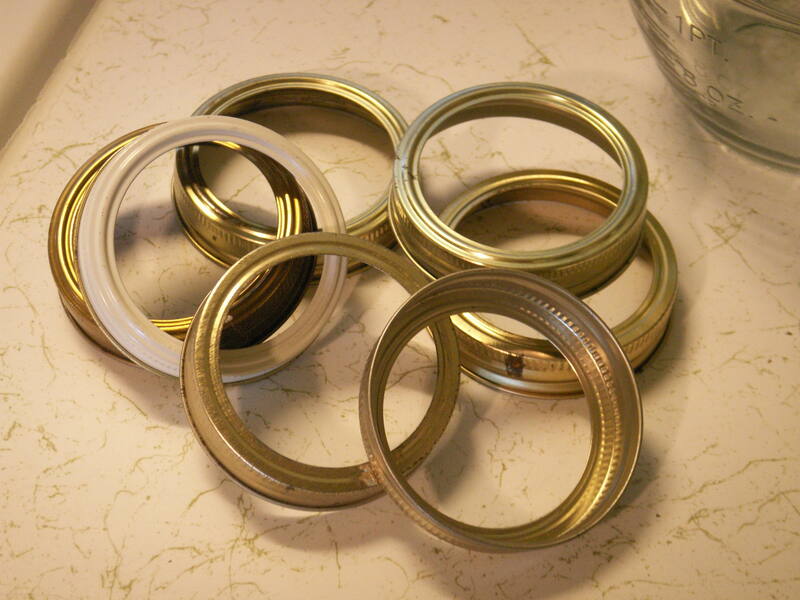 Jar rings to hold the canning lids to the jars. Once you have all your supplies, you can start preparing to can! Step 5: Start the sugar syrup for the jars. Count how many quarts you are putting into the first cannerfull. Use the 4 quart saucepan & put in 1/2 cup sugar & 1/2 cup water for each quart jar. Turn to medium & stir occasionally until sugar is dissolved. 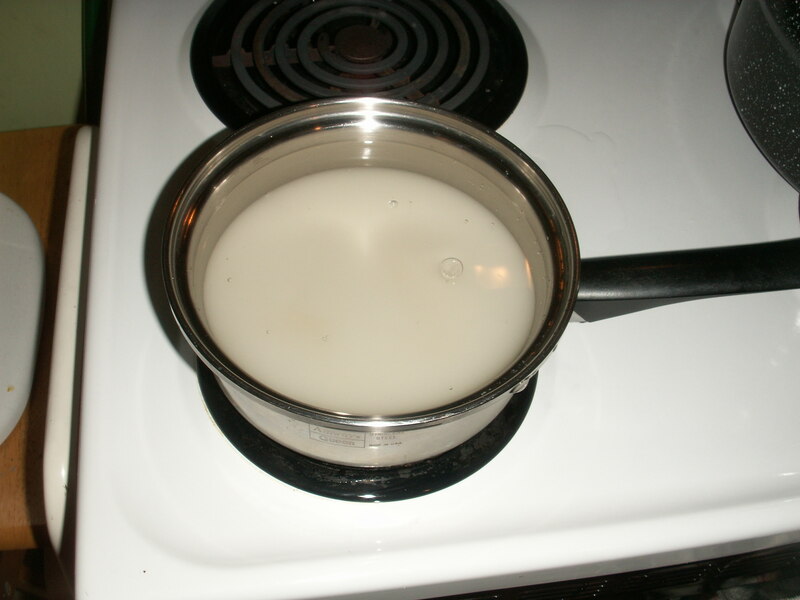 Once sugar has completely dissolved, you can turn the heat down to medium-low if you want, but the most important thing is not to let it boil. 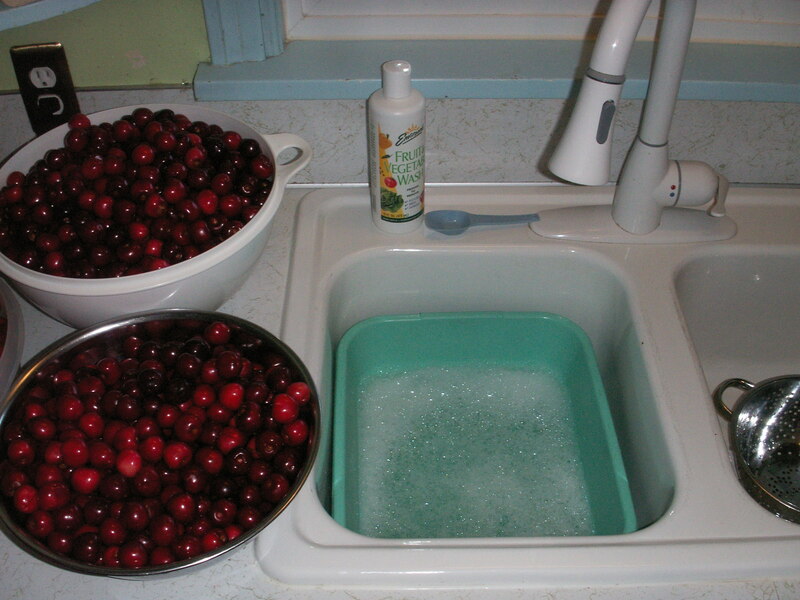 Step 7: Place the dishpan in your sink. Fill it with cool water and add 1 tablespoon of fruit/vegetable wash for every quart of cool water. 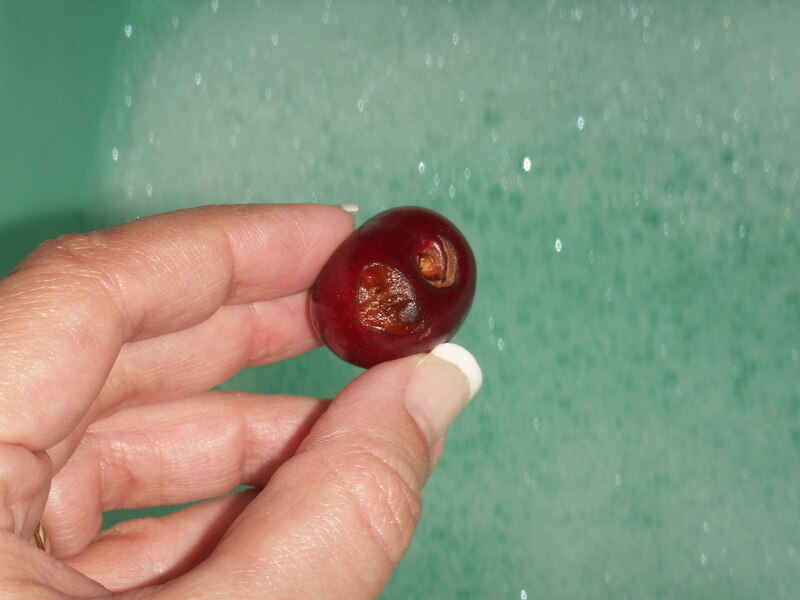 Step 8: Add handfuls of cherries to the soapy water and swish the water around to wash them. As you’re adding them, look them over and toss out any that are bruised or badly split. A small split near the stem area isn’t going to make a big deal, but you do want to use the best cherries. We tossed the “junk” berries out to our backyard chickens. You might want to high-grade the cherries and have a bowl of ones that are too good to throw away, and keep them for nibbling. 🙂 Don’t bother pitting them, that’s part of the fun as you eat! 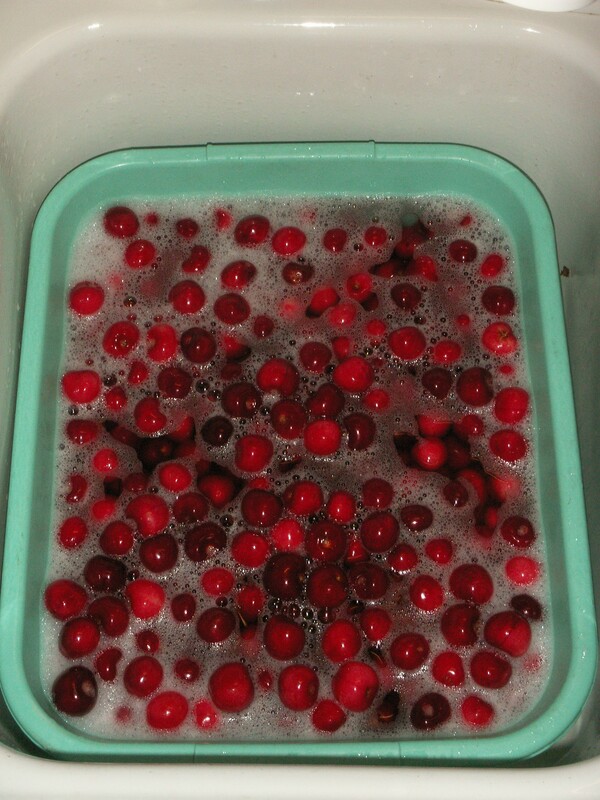 Step 9: Place colander in the sink, and scoop handfuls of clean cherries out of the soapy water. 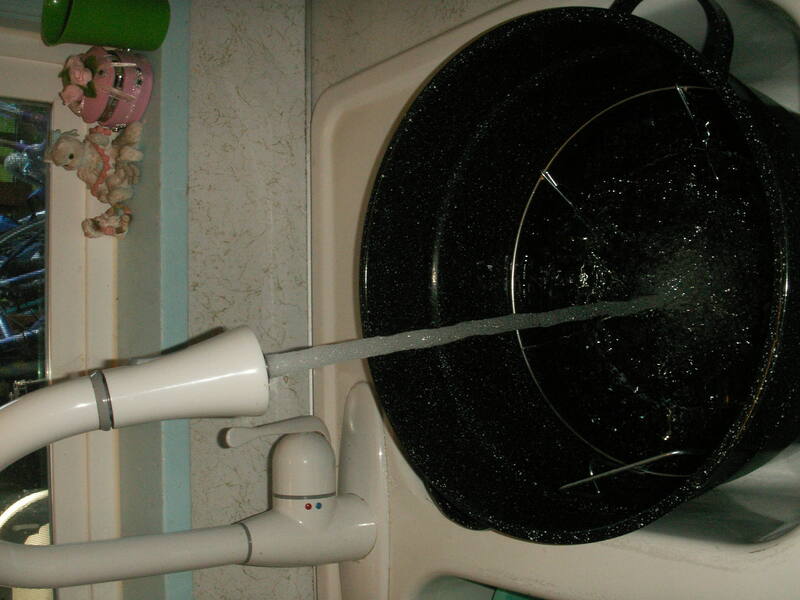 Rinse under running water & put into the colander. Repeat until the colander is full. 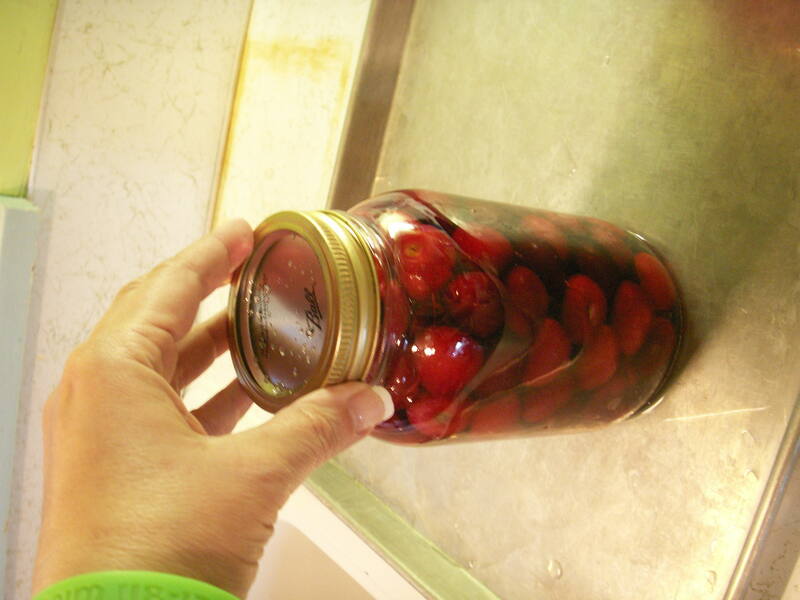 Step 10: Once you have a full colander of cherries, take the plastic canning funnel and place in the top of a jar. 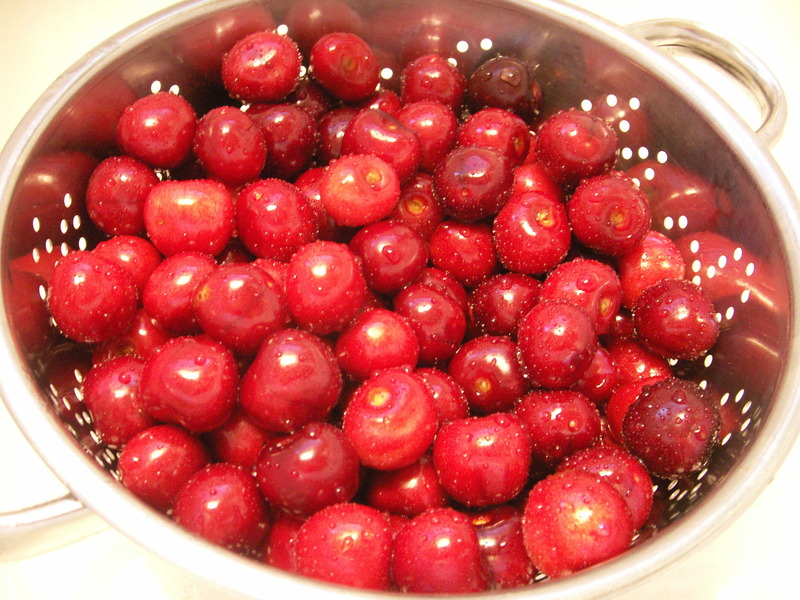 Fill with freshly washed cherries – they do not need to be dry. Slightly pack to the “collar” of the jar, but do not overfill. Repeat for each jar. 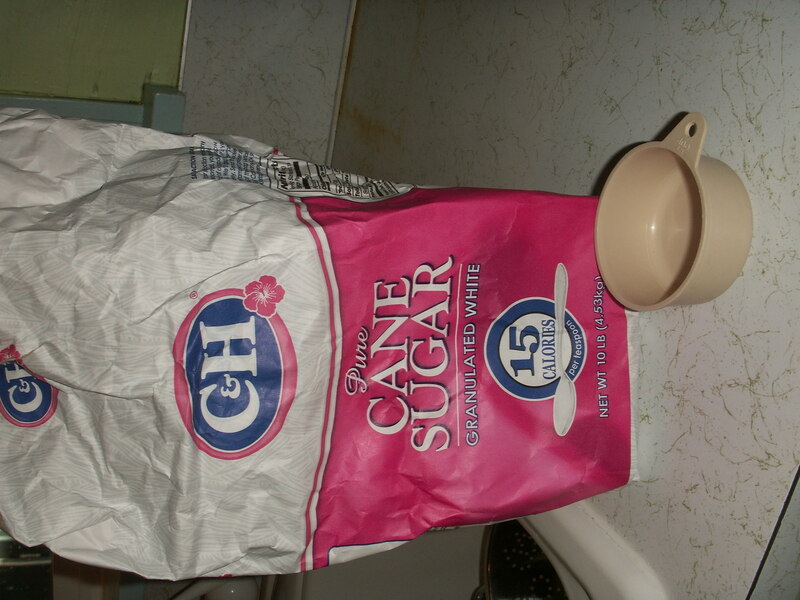 Step 11: Pour the hot sugar syrup into the 4 quart pitcher. If you follow my directions, there should be a little more than 2/3 cup of syrup for each jar. Use the small glass measuring cup to pour approximately 2/3 cup syrup into each jar. Repeat in each of the jars. If there is any syrup left, divide it between the jars. Fill the remaining space with tap water to no closer than 1″ from the top of the jar. It’s better to be a little too low than too high. If you put too much water in, it will expand, overflow in the canner & probably not seal. 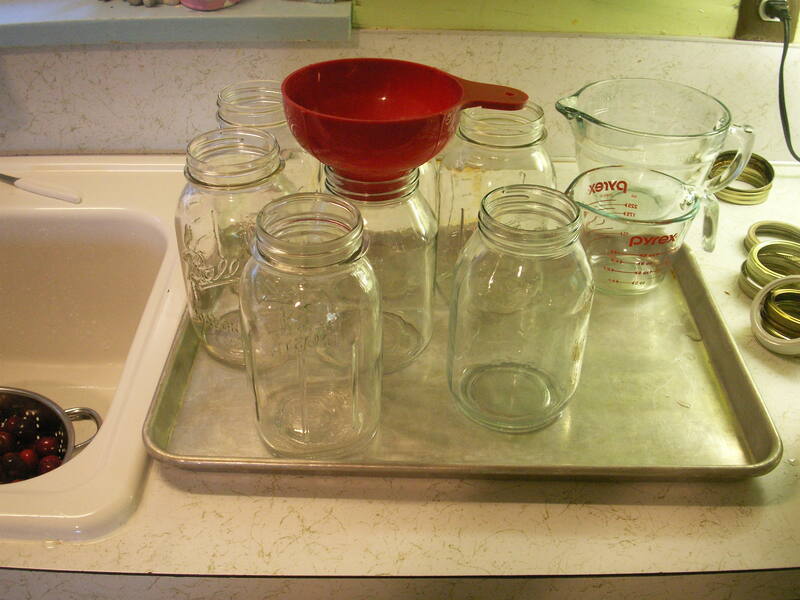 Step 12: Dampen the clean dishcloth and wipe the tops of each jar. Once wiped, I run a finger over the top edge just to make sure that there aren’t any chips or cracks – sometimes they can show up after going through the dishwasher. 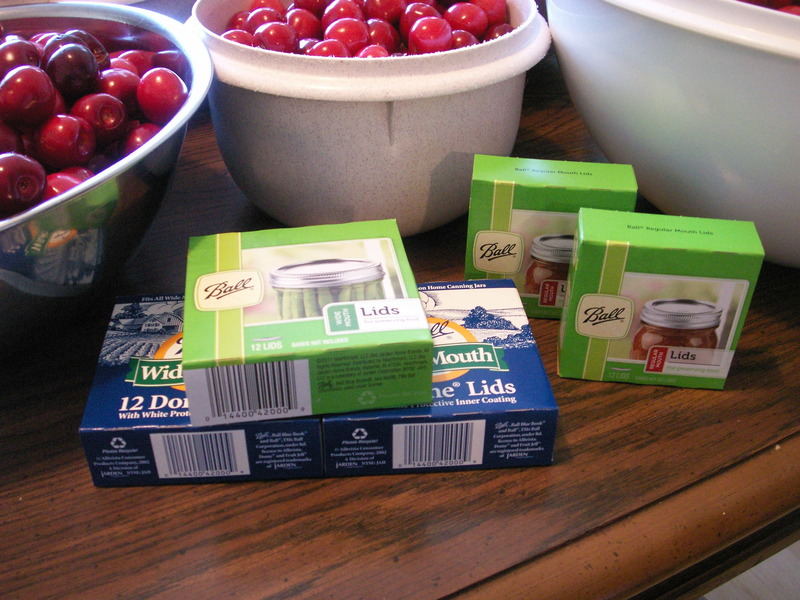 Step 13: Carefully lift out one canning lid from the simmering water – I use a salad fork. 🙂 Try not to touch the rubber area that will make the seal. Center it on the jar & place a jar ring on top. Gently tighten the lid – NOT TOO TIGHT! A good rule of thumb, is to screw it on with a fingertip hold, and once it stops, turn it a hair more. Don’t worry, you’ll get the hang of judging when it’s just right. 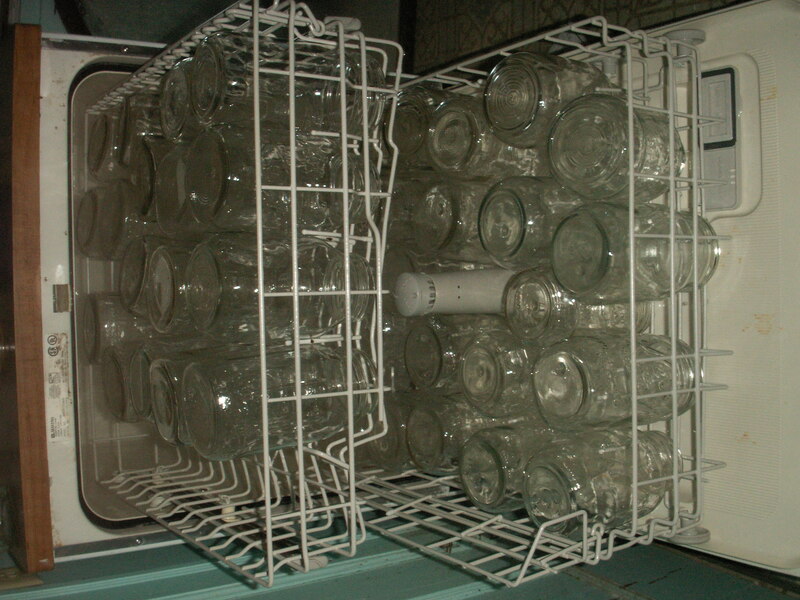 Step 14: Once the jars are prepared, slowly lower them into the hot water bath canner. 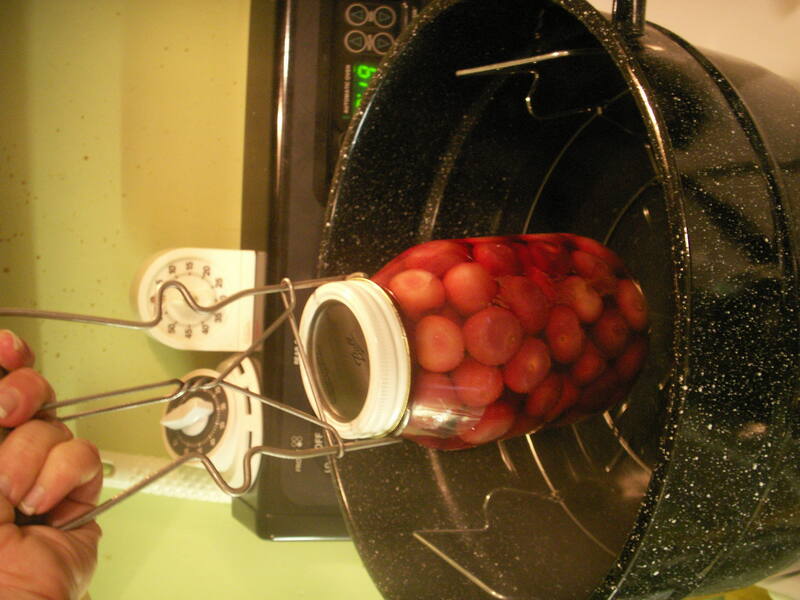 Add enough water to the canner so that the tallest jar is covered about 1/2 inch. Turn the heat up to High, and set the timer for 20 minutes. You might check it a time or two to make sure it’s getting hotter – you never know when the knob could get bumped and it got turned off. (Trust me, I’m speaking from experience here.) If this happens, just add another 5 minutes. Step 16: Listen for the glorious “POP” of each jar sealing. Make sure you (or your kiddos/helpers) do NOT touch the tops of the jars until they are completely cool. If you end up with some jars that didn’t seal, you can choose to reprocess the jars for an additional 20 minutes, or put the jars in the refrigerator & enjoy them right away. I do recommend that you label the tops with the year. 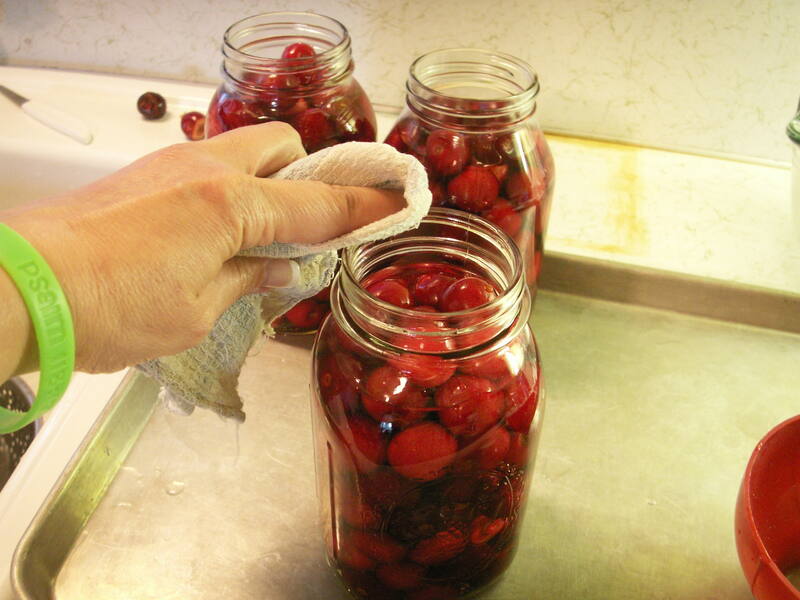 They will keep easily until next year – some people keep them longer, but they really should be enjoyed by next cherry season so you can do this again! Step 17: CONGRATULATIONS! You have successfully learned how to can cherries! I have to share something God did that I think was really cool. Sleeping has been really hard for me lately, and that’s not a surprise considering all the different medications & steroids they’ve been pumping into me. One of the things that happens to me at night, is my mind just runs in all different directions at one time, and it won’t slow down so I can sleep. I’ve tried many things – going on a walk with Tom, reading, praying and on Monday night nothing was working. I knew that when I put in my earphones & listened to KLove it would usually settle me down by centering me on the words of each song. But even when I tried that on Monday night didn’t work right away. My mind was all over the place and then all of a sudden – ZOOM – I felt almost physically centered on listening to the radio. The DJ had started praying. I remember consciously thinking, “What is she praying about that focused me like that?” but nothing stood out as unusual. Within 5 minutes, I was asleep. Thank you Lord. So here’s what has happened lately. This round has been harder on me than some of the previous. I’m not sure why, but it’s just been rougher. I’ve been more sick and for longer. Where it typically starts on day 5, this time on day 3 I was not doing so good. It’s hit me more as tiredness this time. I had someone ask me recently what the “fluids” are that I’ve been going in for. Well, since the second session of chemo, I have been going in on the following Monday (day 5) to get an IV bag full of hydration fluids and another small bag of nausea medicine. This has been pretty helpful as far as keeping the yucky feelings at bay. It takes about an hour and a half for it to be all done if we don’t have any problems with my port. If my port has issues, it can take 2-3 hours. It wasn’t until Friday or Saturday that I actually felt really good – and then I felt REALLY good! 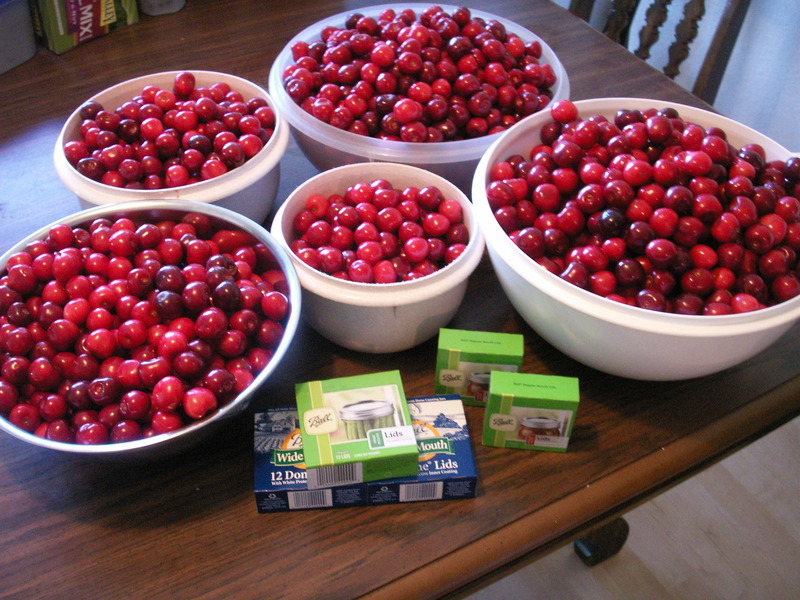 In fact, I felt so good that when Tom went out and picked over 70 pounds of cherries, I had the energy to can 40 quarts of them! Since posting a photo of the jars on Facebook, I’ve had a bunch of people ask for my recipe. Well, I had been thinking I might blog a “how-to” for canning so I took pictures throughout the whole process and am looking forward to putting together a fun post in the next couple of days. Monday & Tuesday we kept the freeway warm with trips back and forth to Eugene for doctor’s appointments – Tom’s this time. On Monday, he had to have an MRI on his head because his neurologist wanted to see if he could find any reason for the constant headaches he has. Tuesday was an appointment with the pain clinic, again, because of the headaches. 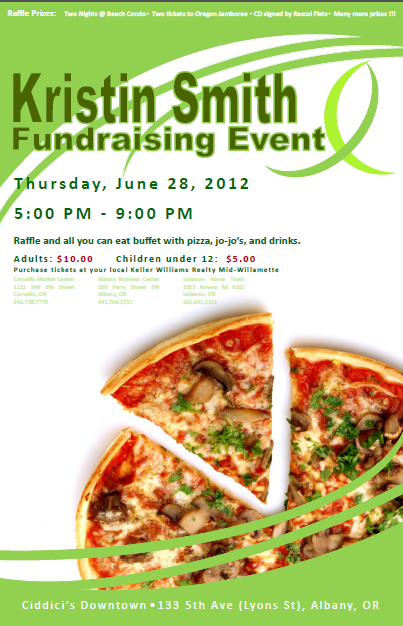 Tomorrow in the morning is my oncology appointment (we’re taking the kids this time) and in the evening is the fundraiser that my work is putting on at a local pizzeria, Ciddici’s, here in downtown Albany. We’ve got a few surprises in store for the kids between the two events, but you’ll have to wait and see. 🙂 By the way, tickets for the pizza buffet will be sold at the door, so if you don’t have any, feel free to just drop by – we’ll have food! This round of chemo seems to have been tougher than the last. I’ve heard that can be the case, but until you actually experience it, it doesn’t seem real. For the first time in what seems like weeks, I was able to sleep in on Sunday morning. It felt so good to get the rest my body needs. Still, I was tired and feeling nauseous even after waking up. I’ve been trying to do some much delayed digital paperwork lately, so I worked on that. It’s just not right. I mean, I’m just SITTING there. I’m not doing anything physical. Yet, I’m so tired. It’s like the zest for life has just been sucked out from me. At this point in my chemo cycle, it pretty much has. Mom came over yesterday & picked me up so we could have lunch with Grandpa & Grandma Gerig. I think this is the first time ever that all of our husbands have been gone at the same time. Tom & the kids were camping, and Mark & Dad had gone to the claim in Southern Oregon. So we got Chinese take-out and had a Father’s Day dinner with Grandpa. It was nice to share that time with them. Yep, that verse is for me. There are two wolves that fight in me. 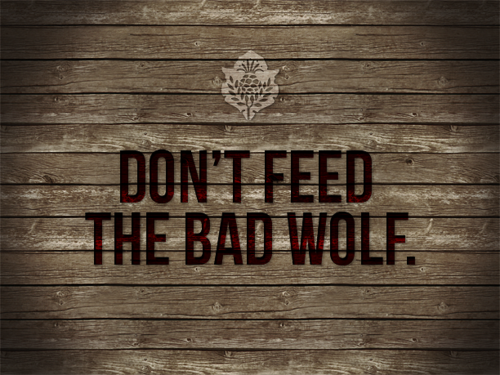 The one wolf is evil: He is fear, anger, envy, worry, regret, sorrow, greed, arrogance, self-pity, guilt, resentment, inferiority, lies, false pride, competition, superiority, and ego. The other wolf is good: He is joy, peace, love, hope, sharing, serenity, humility, kindness, benevolence, friendship, empathy, generosity, truth, compassion & faith. It’s amazing what you can get done when it’s quiet. Tom & the kids went down to the Pioneer Picnic & I have been working on digital paperwork for the majority of the day. Thankfully, my mind is relatively clear enough to do it – which is why I’m doing it now & not putting it off – well, off longer than I have already. I can definitely tell I’m slower though for sure! When I woke up this morning, I could tell I was a bit nauseous, so before even getting up, I took one of my anti-nausea pills. Then I got a surprise. Just as I was ready to fix something for myself for breakfast, Andrea (my sister) texted me and invited me to come over for breakfast. What a treat! But when I walked out my back door, I was met with 7 free range chickens! Apparently, a piece of the fencing got loose and the girls pushed it out. I thought, “No problem, I’ll just get some food, toss it in the chicken house & they’ll run right in. As I walked back to the house, I heard footsteps behind me on the deck. I was being followed by the Rhode Island Red. I think she would have gone inside if I’d let her! I thwarted her plan for getting inside, but my plan for getting them inside THEIR house worked like a charm! Once the chicken-wrangling was done, I headed over to Andrea’s. Morning menu was pancakes with syrup, peanut butter & bananas and coffee. The best part was that I didn’t have to make it myself. In the afternoon, it got a little bit bad again, but I was able to kinda keep the nausea at bay. Then for dinner I got to try some of Andrea’s Quesadilla Casserole. She said it’s a meal that ALL her kids like – quite an accomplishment! So even though I was a little concerned that it would be too spicy & not settle well with my stomach, I tried it, and it wasn’t too bad, especially with the homemade applesauce – yum! After dinner, we jumped in her car & got in on the last day of the “Buy $40 worth of product & get $10 off” special at Bath & Body Works in the mall. I think I have enough lotion for the rest of the year, and probably enough for gifts too. 🙂 Andrea & I split it, so we didn’t really go THAT much overboard. 🙂 But I almost forgot – I got the best deal on a sun hat tonight at Claire’s! Regularly $20, it was on sale for $5 – woo hoo! Now I can go into the backyard without worrying about making sure that I am standing in the shade of a bush. As I recover from chemo, if I blog, you may notice a difference in my writing. At least I think I notice something. So for that reason, I may choose not to blog some of these days. I’m just so thankful that I can feel good enough to do anything! Thank you all for your prayers, I really appreciate them! Chemo Round 4 – DONE! I had a great session of chemo today! After my labwork & checkup (this time with Dr. Kovach), I made my way to the chemo lounge. My favorite chemo chair was open – it’s a recliner that has a great view & is all by itself. I don’t know why, but when I’m getting chemo, I don’t want to socialize. I was visiting with Mom, and I even commented that I just want to be by myself. Is that selfish? I don’t mean it to be. All I want to do is rest & get the medicine I need. Another thing I found out was how to read my lab report. Kinda important… I found out that my White Blood Cells are .75. What does that mean? Glad you asked. With any other kind of cancer, that would mean my white blood cells are too low for chemo, and they would have to postpone my treatment until my count was above 1.0. Except in the case of Hodgkin’s Lymphoma. With Hodgkin’s, they proceed with chemo no matter what your count is. This time, it’s actually high for me! On 5/31, my count was .42, on 5/17 it was .26! To give you an idea of how far down I’ve gone, when they did my very first lab workup before I had my first chemo, my count was 6 – as in 6.0! The lower my count is, the higher risk it is for me to be around other people and especially anyone not feeling well. Here’s what happens with the blog when I’m feeling good: I have tons of thoughts & plans in my head & they never make it to the blog because I’m so busy trying to get everything done that I need to do while I feel good! It’s like a vicious cycle. Similar to how things went the very first round of chemo, I have had a great week this week. 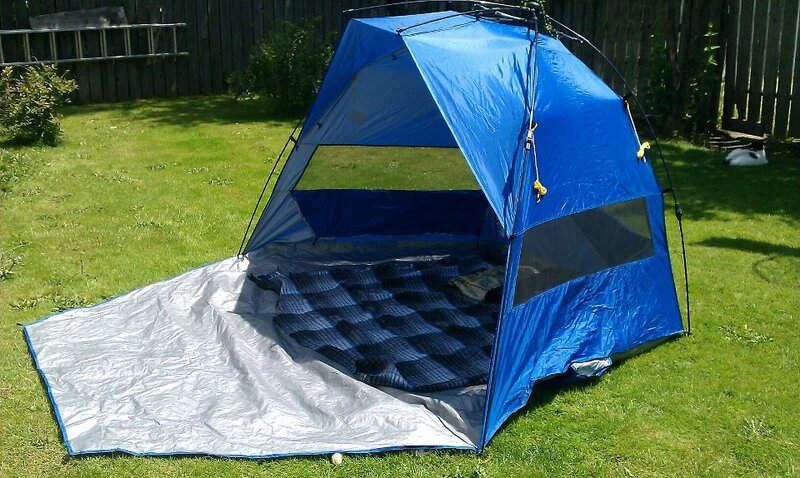 I have been able to enjoy the sunshine – either in my little backyard shelter or in the shade of trees & bushes. I’ve been able to go on walks in the evenings with Tom. I feel normal – well maybe a warped version of normal. 🙂 I have felt pretty level emotionally – not seesawing too much until today. Tomorrow is my fourth session of chemo. I liken it to riding a roller coaster – you know those old rickety sounding wooden ones that have breathtaking climbs until you get to the top & plummet to the bottom, just to whip around a corner & do it again. I’m up at the top of one of those climbs. It’s slowing down, and preparing to tip over the edge. So I’m gonna raise my hands high, and let out a yell, because as you know that’s the best way to ride the scariest ones.